According to GamesIndustry International and two of its sources, the Wii U is expected to have unimpressive graphics hardware. In relation to the Playstation 3 and Xbox, "the graphics are just not as powerful." stated an anonymous developer from GamesIndustry. A second developer who works for a "major company" corroborated this opinion, adding that although it is more modern, there aren't as many shaders. 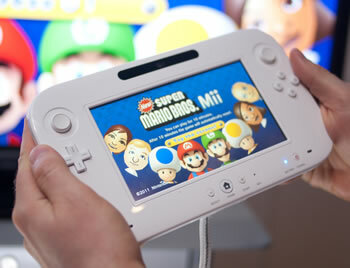 The Wii U just "can't quite keep up", the source said. Since we're talking about rumors, WiiUDaily has also reported what they believe to be the Wii U's launch date: November 18, 2012. According to WiiUDaily, this date comes from an internal Media Land memo, one of the largest video game shops in Japan. It's interesting to note that in 2006, the original Wii launched on November 19. Both dates fall on the third Sunday of November. Given the long stretch of time that exists between current-gen and next-gen consoles, we've all come to expect each iteration to be vastly superior to its predecessor. Superior in what way, though? In an industry where high-end performance is necessary to push impressive graphics, speed has traditionally been paramount. In recent years however, there seems to be a growing expectation of innovation as well. A good example of this is the Wii itself, when it disrupted the long-held status quo of console gaming with its motion-sensitive controllers. Nintendo may be trying to replicate that success by shaking up the gaming establishment once more, but this time with tablets. A good reason for a slower console, explains GamesIndustry, may be cost. When compared to a traditional or even motion-sensitive controller, Wii U's tablet-based controller must be far more expensive to manufacture. I believe most of us know what a cut-throat industry console gaming is. Nintendo may have decided to scale back on the Wii U's graphics hardware in order to retain its unique, tablet-centric vision, yet keep the system affordable.